Talk about competition in the inbox: Today, organizations and individuals send and receive 269 billion emails a day, according to The Radicati Group. That number is expected to increase by an average of 4.4% a year to 319.6 billion by 2021. Last chance! 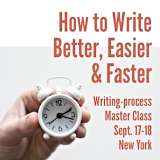 Only 5 tickets to my email marketing class remain. 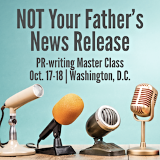 Don’t miss your chance to get read by making your emails relevant to readers on Nov. 7-8 in D.C. Book now.